Whether it’s a small elopement or an over-the-top bash, if you’re planning a wedding in France, you’re probably overwhelmed with the concept of picking venues, flowers, and vendors sight unseen from thousands of miles away. Here are a few sources to help ease the planning process! We offer several photography packages for both small, intimate elopements as well as large, traditional weddings. Please contact us for more info! Musée des Arts Forains – This vintage carnival museum looks like a step into the past, and your wedding guests can be seated alongside a working human-powered carousel or surrounded by circus performers like jugglers, fire breathers, acrobats, and aerial silk artists, with snacks of cotton candy and fresh popcorn handed out as midnight snacks. The carnival rides and games can still be used, making for a once-in-a-lifetime reception venue no one will ever equal (or forget!) It is a larger venue, suitable for 200+ guests. Chapel Expiatoire – If you can get past the morbid origins of this chapel (it’s the burial place of Marie Antoinette and Louis XVI), this neoclassical domed chapel is a gem and one of the most popular locations for small Paris weddings and elopements. The architecture is unmistakably French, the huge dome makes for beautiful acoustics for a small vocal or orchestral group to perform during your ceremony, and the walled garden surrounding the chapel is stunning for portraits. Plus you get the luxury of being isolated from the public, which is rare in a busy city like Paris. Les Ombres – The perfect solution for Eiffel Tower lovers. This gourmet restaurant is located on the roof of the Musée Quai Branly, less than a block from the Eiffel Tower, and the outdoor terrace offers one of the most stunning views of Madame Eiffel you can find, day or night. Inside, the restaurant is surrounded by walls of window so you can dine safely inside year round without sacrificing your view. Lapérouse – This restaurant’s unique history makes it a very popular spot for newlyweds for over a centuries. Legend has it that new grooms used to bring their brides (and mistresses) here for a lover’s dinner, and the ladies would scratch their diamond rings against the mirrors to ensure that the diamond was real! To this day, the staff welcomes new brides and grooms to test their rings on the vintage mirrors adorning the walls. They also have a special private room just for newlyweds. Seine Wedding Cruise – Tour boat company Bateaux Parisiens offers boats for rent for private events, including full dinner, dancing, and bar services. Your boat can cruise up and down the Seine, viewing Paris at its most beautiful. There are also small houseboats available for rent via Paris Attitude for elopements or very small groups. Champ de Mars – The long public garden stretching out from the base of the Eiffel Tower offers a number of options for wedding ceremonies, including a large covered stone gazebo for big wedding parties, and a small semi-private landing tucked just beside the base at the top of a small waterfall. The best part about this option – it’s free! If you don’t mind the possibility of tourists stumbling onto your ceremony, there are some beautiful spots here that you can visit again and again with each trip to Paris you take. Churches – For those longing more a more traditional venue, both the American Cathedral and the American Church offer ceremony services. Hotels – There are a number of hotels that offer beautiful venues and views of Paris. This is the most convenient option, as you and your guests can party all night long while dining on some of the finest quality food in Paris and have a short commute back to your room when your feet grow tired. My favorites are *Hotel Crillon (Starwood Collection, *currently closed for renovation), Shangri-La, Four Seasons George V, and Plaza Athenee (Dorchester Collection). 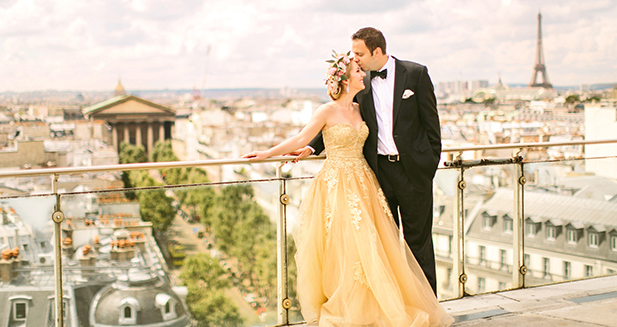 There’s no better resource for those planning French nuptials than French Wedding Style blog. Monique carefully curates the best of real weddings and portrait sessions as well as compiling some of the best vendors in town. Definitely start your planning here, and be sure to peruse the real weddings gallery for a look at what brides who have come before you have done. FWS also has a great list of vendors throughout France covering everything from officiants to makeup artists. Many bride’s are familiar with the number one wedding blog in the United States, Style Me Pretty. Now there is a sub-section of the site that is completely dedicated to weddings in Europe. Style Me Pretty Europe This resource can be extremely useful when planning from afar. Flyaway Bride is a gorgeous wedding blog specializing in destination weddings, and their resource guide is incredibly helpful for brides planning a wedding anywhere in France. I can get lost in the pages of their blog looking at beautiful ceremonies all over the world! For those who speak French (or only care about photos), La Mariée aux Pieds Nus is a great French-language wedding blog that showcases more traditional French weddings and elopements. This can be a great resource for those getting married in France but outside of Paris. Another useful resource is a fabulous book from Kim Petyt, formerly with Paris Wedding. Kim was an American wedding planner in Paris that helped hundreds of couples plan the wedding of their dreams in the City of Love, so there’s no one more qualified to dole out advice and suggestions. The book offers tons of beautiful photos, hilarious anecdotes, and beaucoup advice for anyone planning a wedding or elopement in Paris. You can purchase it on Amazon.com here. For hairstyling, we recommend Ciara Coiffure and Danielle Carson. For makeup, we recommend Isabelle Reda, Onorina Jomir and Charles Gillman. All of them speak English fluently and are a treat to work with! I cannot recommend a wedding planner highly enough, especially when planning a destination wedding, proposal, or elopement. These coordinators have the experience and connections to create a dream wedding day for you without you even having to lift a finger. When selecting a coordinator, make sure you ask for multiple examples of their work, and be sure to have them specify what vendors and services they are responsible for. Ask for recommendations from past clients, and ask to see example of their published work on blogs or magazines, if possible. Make sure you select a planner whose personality and aesthetic matches your own and who you get along with fabulously. When choosing your travel agent, there are two options. The first, and most common, is to choose a travel agent that does not charge a fee, and allow them to work with their partner airlines, hotels, and tour companies. These companies offer incentives to the agents for sending clients their way, which is why you pay nothing. However, when you work with these types of agents, their compensation is dependent on you using their partner companies, so your options may be somewhat limited. The second option is to go with an agent that charges a fee up-front. Since this free compensates them for their time, they can work with a wider range of vendors, sometimes saving you money in the process. Each option has its pros and cons, and neither is inherently better than the other, so just make the choice that is right for you and your situation. Some travel agents only book flights and accommodations while others are full-service trip planners who can also secure restaurant reservations, tour guides, and transportation within the city.